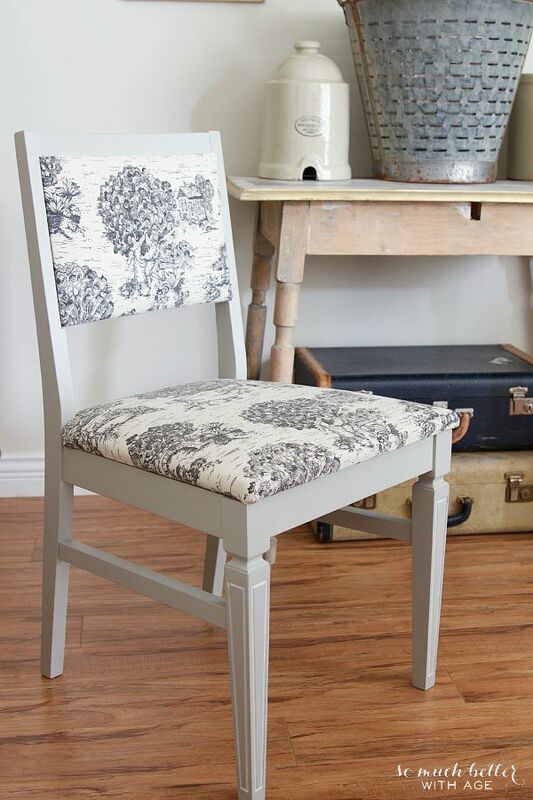 This toile chair makeover is very easy to do and you can transform any wooden chair in to a French chair. 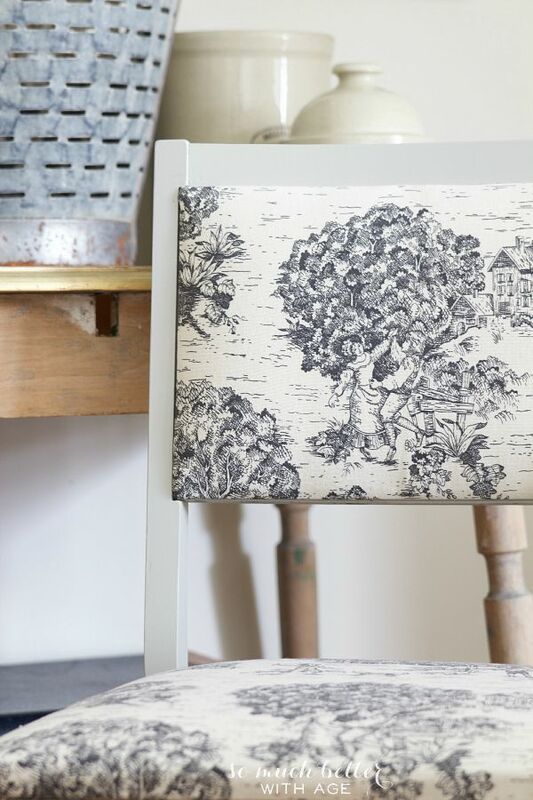 Toile fabric is so quintessentially French and I’ve always wanted to use it on a chair. 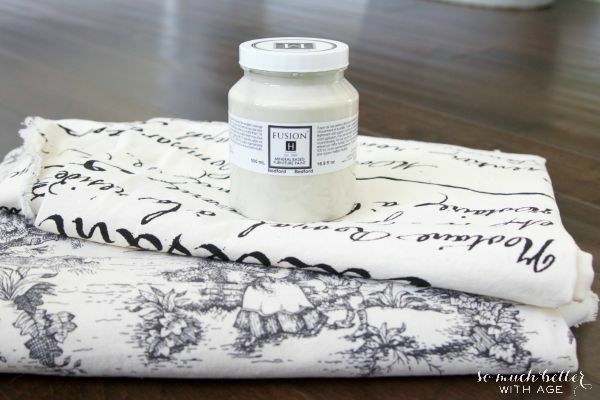 This pastoral toile went perfectly with grey paint so it was the perfect combination. I picked up a pair of wooden chairs for $10 at a local thrift shop and started the makeover. 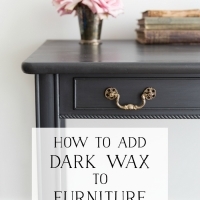 I used Bedford which is a great light grey and Champlain, my favourite cream, for the details in the legs. 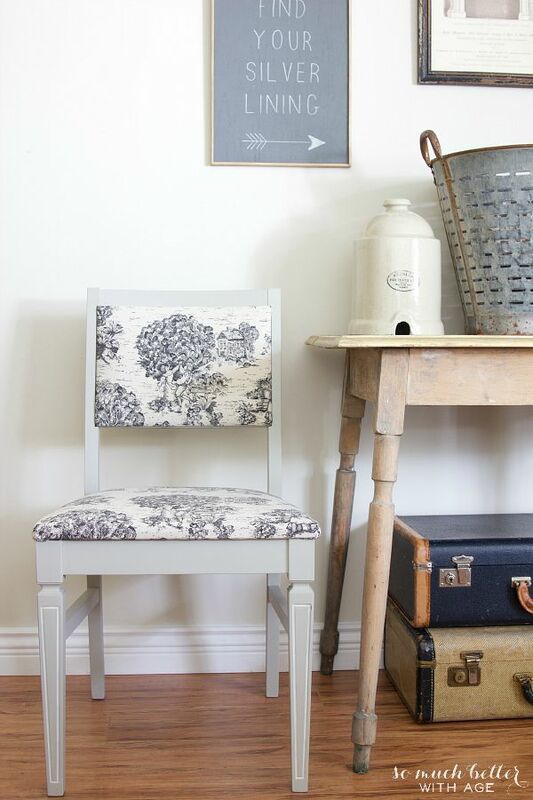 This pastoral toile fabric is no longer available in black and cream but I found it here in a beautiful taupe. After taking apart all the upholstered pieces, I simply painted the chairs and used clear furniture wax after to seal it. I didn’t sand the chairs before or anything. I removed the old fabric from the back and seat boards, then used it as a template for the new fabric and stapled the new toile fabric on. Chairs like these have got to be the easiest piece of upholstered furniture to learn on. 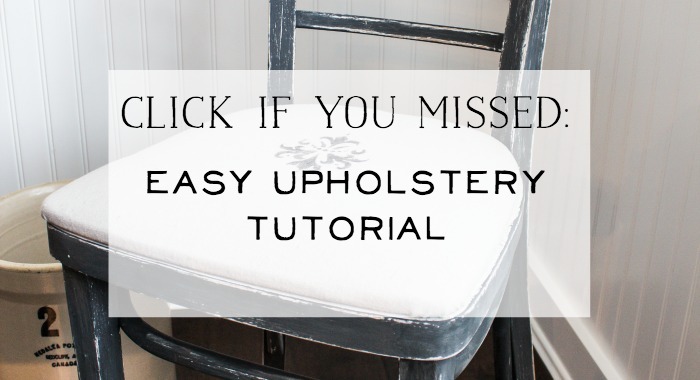 You can find my easy upholstery tutorial here. They look perfect in my pied-à-terre, don’t they? I’m still not sure if I am keeping them yet or selling them. But I do love them! 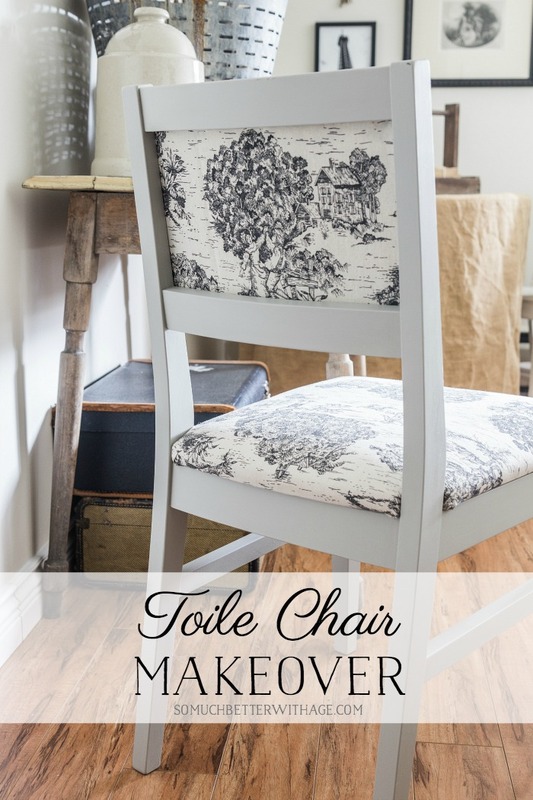 What do you think of my toile chair makeover? 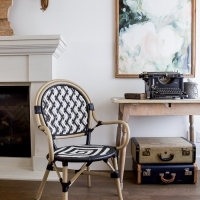 Do you want to makeover some chairs today? I love the change. How simple and how dramatic! Stunning. Gorgeous colour & I love that blue highboy colour as well. I’d love to try that paint!! Thanks for the giveaway! Oh the chairs look so much better! So pretty! My favorite paint color is renfrew blue! The chairs look amazing Jamie! Great choice in color and fabric. Love them! I have been looking for a color for the furniture in my new den. Aubusson is perfect. I love these! What a wonderful job! I have also absolutely fallen in love with Fusion Mineral Paint! 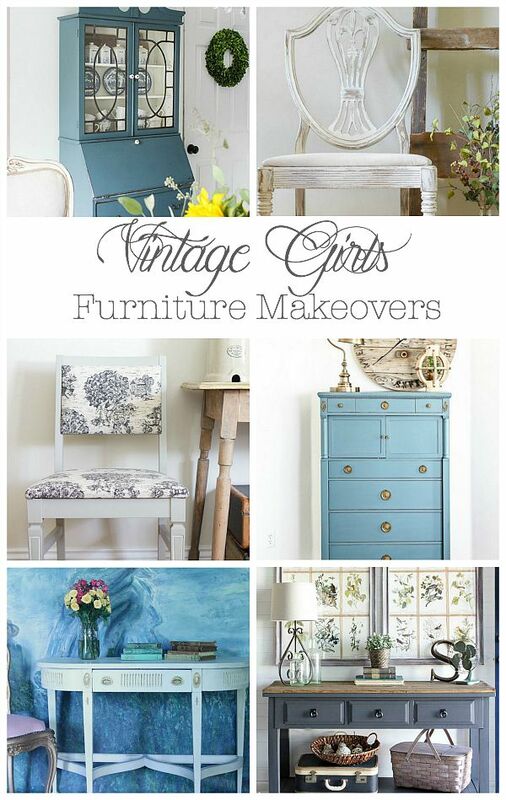 (favourite colour is definitely Inglenook<3) Thanks for posting these great makeovers. I love the Champlain….and I have a lot of furniture to paint! I would like to try Sterling! I like the color Bedford. It would match the color in my bedroom. I love Liberty Blue and ash but I’m in love with many of the colors. I hope Fusion will come out with a coral and lime green soon! 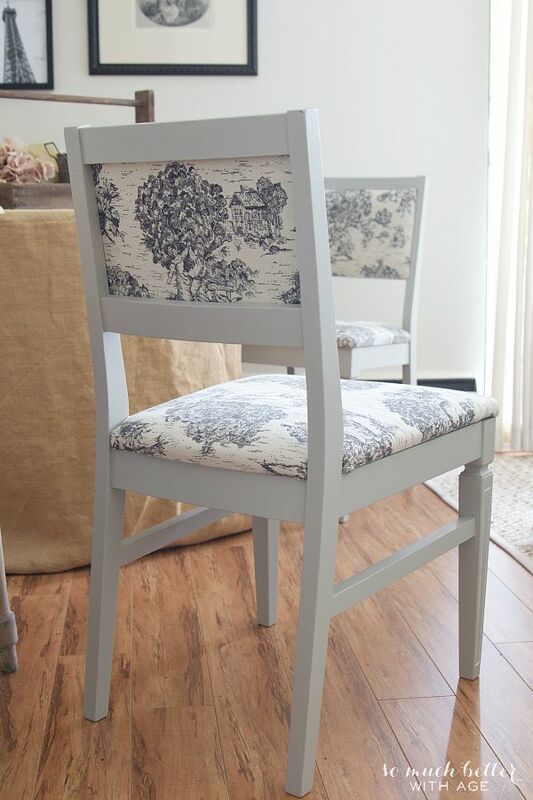 Love your fabric choice, I think I would have overlooked these chairs but you have made them over perfectly. Love the chairs! I painted my first chair yesterday…..so easy and turned out great! I have read about Fusion paint, and I would love to try it. 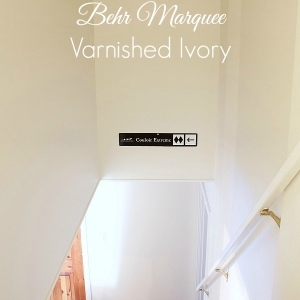 I follow your blog on Bloglovin and really enjoy your posts. Keep up the great work (fun!)! 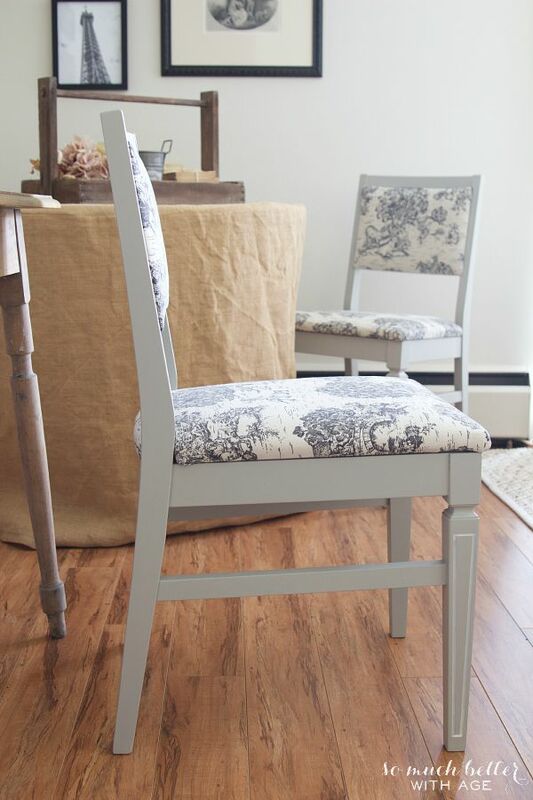 That proves a little toile goes a long way for impact, especially when paired with a pretty paint color. 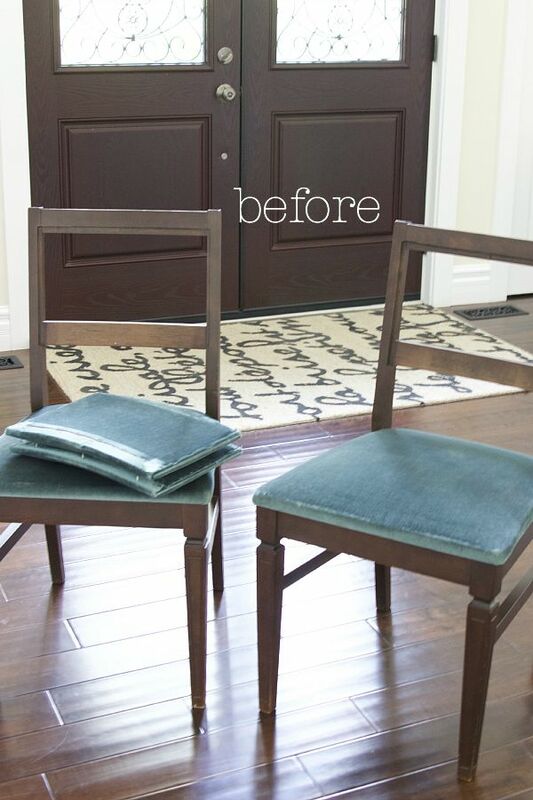 Beautiful chairs, great makeover!! Well done! I just bought my first house all by myself and have been painting all the things. This is a great idea for some chairs I have sitting around! I’m absolutely swooning over Sterling! 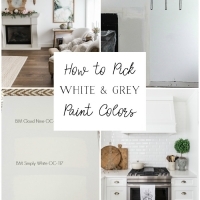 I love the sterling shade, a second favorite was was the oil lamp white. Very pretty, Jamie! And toile is always so elegant. I have one chair from thrift shop I need to redo and that gray looks so pretty, think will be the color for that chair. Been waiting for something to tell me how to redo chair and think your chairs have inspired the right direction. So thanks and so glad you shared your gorgeous chairs. 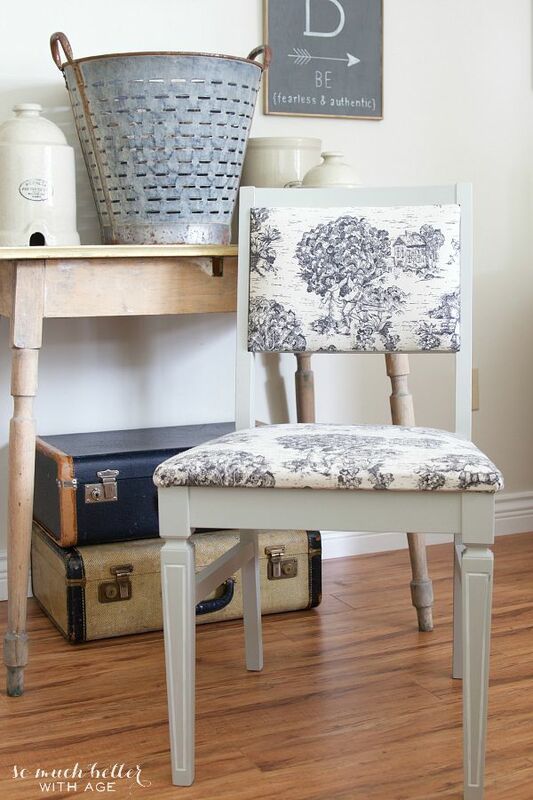 Hope can find some wonderful toile similar to yours for the seat. Now to find the chair in our shed, ugh. So hot and nasty out there .I avoid it untlI I need a book. Thanks Jane Ellen! Good luck with your chair makeover!